Over the last few days, heavy monsoon has led to severe flooding across Kerala in India. Torrential rain and massive landslides destroyed most part of the state. Kerala is facing its worst flood in 100 years. Within a week, we have seen hundreds of death, a million people displaced and in relief camps, thousands stranded in flood-hit areas without food, water or medicine and unimaginable human suffering. Kerala needs help. We have to #StandWithKerala. Namaste Wings To Fly will be working with ground level flood relief campaigns to help those affected by the natural disaster. We need your support to provide immediate relief to the victims. Together we can rebuild lives. Solidarity gives meaning to humanity. NAMASTE WINGS TO FLY provides distance support to guarantee child and kids their rights to health and to study. NAMASTE WINGS TO FLY develops projects to help communities in distress. Namaste wings to fly works in order to safeguard the right to study and improve the health conditions of disadvantaged child and kids. In order to achieve this goal, intervention by distance support is encouraged. Besides, Namaste realises development project aimed at improving woman’s condition, specifically to those who live in social and economic difficulties. to promote a cooperative approach for solving community issues. 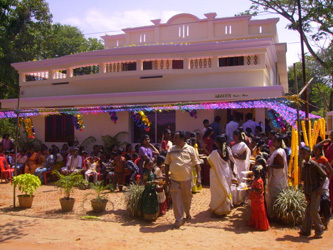 The name of the organization stems from our precise intention to create a protective environment for post-harm children or children more vulnerable than others because coming from underprivileged communities, mainly by means of high quality education, that in the future will turn into wings to fly towards a more dignified life. Our projects are also focused on the social and economic empowerment of Indian women through training, employment and income generation activities with the ultimate objective of making all women economically independent and self-reliant. Our service areas are Trivandrum district Kerala and Kanyakumari district Tamilnadu. Namaste does not belong to any political or religious trend but it intervenes according to the universal values of solidarity. As a matter of fact, its effort is focused on helping the neediest and the neglected part of the society. Although it mainly promotes educational project for youth, it also handles other issues, such as health issues and construction or renovation for the most disadvantaged, alongside with woman’s work-related problems. Namaste, a little association with a big heart: yours! 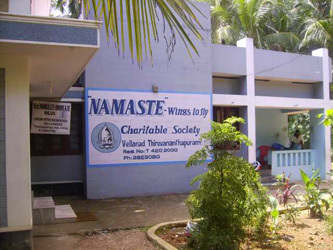 Namaste Wings to Fly headquarters are based in Vellanad, a small village situated 25 km north-east of Thiruvananthapuram City, covered by rubber plantations and coconut forests. Vayo Kshema: a Project for Abandoned Aged.